before i started making pedals fo r sale, i played in a great band named the Bon Savants. our bassist (dave), for the most part was an always-on-fuzz-guy and used a somewhat clunky and convoluted setup involving around 3 pedals to get his sound. i told him i could simplify things and give him even more awesome toanz and the team awesome! fuzzmachine (or TAFM) was born. 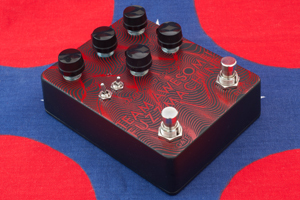 the smallsound/bigsound TAFM was designed for low end heaviness with the ability to cut through a mix, to simply keep your guitar’s pick attack while having a really saturated fuzz-tone or just to have a subtle background fuzz behind your main keyboard sound. the TAFM excels at versatility and fitting in with almost any instrument in almost any musical setting. the thick, gnarly fuzz is perfectly complimented by a slightly gritty clean blend which retains all the low end you’d need… plus more. rough overdrive, howling feedback, clean boost with fuzzy sparkles, even phase-cancelled signals for pseudo octave-up/weird discordance and everything in between. you’re either on team awesome… or you’re not.